Based on several recent experiments, there is a strong possibility that honeybees are drawn to the same chemicals that could mean their downfall, with the experiments themselves featuring bees that preferred water mixed with the chemicals and not just sugar. These findings, which were published recently in Scientific Reports, indicate that popular fungicides and herbicides pose an even greater danger to honeybee populations than believed previously. With insecticides like neonicotinoids, known for shortening exposed bees’ lifespans and generally wreaking havoc on a hive’s health, being used on plants, the nectar forager honeybees bring to their hive, where honey is produced, can profoundly affect the colony’s health. While scientists know which chemicals are known for negatively affecting bees, the question remains regarding the amount of exposure bees are getting—in terms of chemical amount pervading the surrounding area and the amount of actual contact the bees have with them. In this recent study, scientists discovered that forager honeybees are drawn to glyphosate (an herbicide ingredient in Monsanto’s Roundup) and chlorothalonil (a fungicide) in certain concentrations. Past research has indicated chlorothalonil as being linked to the fungal parasite Nosema bombi, which affects bumblebees. 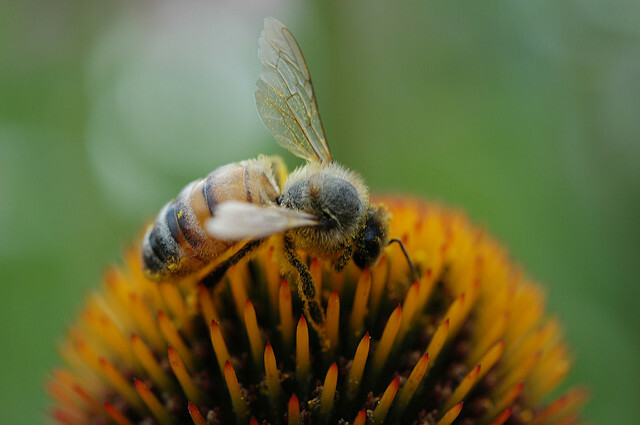 Meanwhile, glyphosate may affect honeybees’ abilities to navigate and learn. In the study, honeybees were provided with sugar syrup and a sweet mix blended with a few herbicides and fungicides at various concentrations. Several sugar water feeders that contained naturally occurring chemicals were also included. In addition to chlorothalonil, the honeybees were also attracted to quercetin, a natural, healthy chemical found in many food sources. “There’s quercetin in nectar—there’s quercetin in pollen. Quercetin is in honey and beebread, and it’s a reliable cue that bees use to recognize food,” says Berenbaum. While foraging bees can sense potentially unsafe chemicals, they “have the ability to evaluate food quality and use phytochemicals as cues to make foraging decisions,” as described in the study. The bees can occasionally positively classify agricultural chemicals, thereby being drawn to them in kind. This may be the result of evolution, with foragers seeing the chemicals as a new kind of food to collect during scarce times.